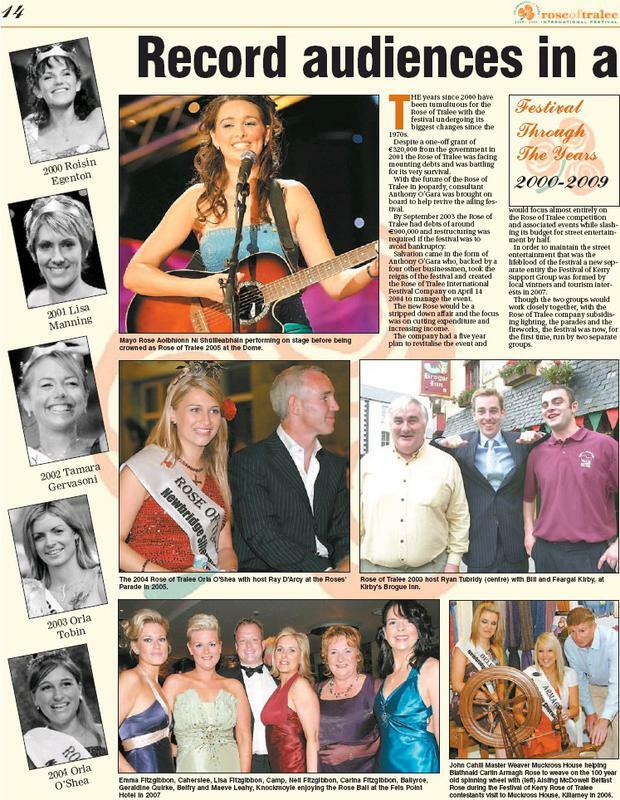 THE years since 2000 have been tumultuous for the Rose of Tralee with the festival undergoing its biggest changes since the 1970s. Despite a one-off grant of 320,000 from the government in 2001 the Rose of Tralee was facing mounting debts and was battling for its very survival. With the future of the Rose of Tralee in jeopardy, consultant Anthony O'Gara was brought on board to help revive the ailing festival. By September 2003 the Rose of Tralee had debts of around € 900,000 and restructuring was required if the festival was to avoid bankruptcy. Salvation came in the form of Anthony O'Gara who, backed by a four other businessmen, took the reigns of the festival and created the Rose of Tralee International Festival Company on April 14 2004 to manage the event. The new Rose would be a stripped down affair and the focus was on cutting expenditure and increasing income. The company had a five year plan to revitalise the event and would focus almost entirely on the Rose of Tralee competition and associated events while slashing its budget for street entertainment by half. In order to maintain the street entertainment that was the lifeblood of the festival a new separate entity the Festival of Kerry Support Group was formed by local vintners and tourism interests in 2007. Though the two groups would work closely together, with the Rose of Tralee company subsidising lighting, the parades and the fireworks, the festival was now, for the first time, run by two separate groups. While visitor numbers continued to drop the Rose brand has flourished and the contest remains hugely popular with television audiences. The Rose of Tralee is a constant feature in RTE’s top ten most watched programmes every year with 881,000 tuning in for present host Ray D’Arcy’s debut in 2005. A year later and there was another first for the Rose when the contest went online. For the first time the two selection nights were broadcast live on the web for the first time allowing audiences from Boston to Brisbane to tune in and watch the action from the Dome as it happened. In 2007 there was another moment of Rose history with the sale and eventual closure of Tralee Racetrack which the Rose of Tralee was first created to support. 2008 saw another Rose first as the eligibility rules were changed to allow unmarried mothers enter the competition for the first time. The rule change was a major move for the Rose of Tralee which in 1996 had been at the centre of a national debate following a row over the Rose’s ban on single mothers. Where the Rose of Tralee will go from here is impossible to predict but the next 50 years should be every bit as entertaining and exciting as the last half century. Having emerged rejuvenated and reinvigorated from looming financial disaster, the future looks bright for Ireland’s most famous festival.